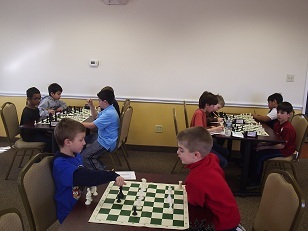 Twenty three players in three sections competed for top honors at this month’s K-8 Scholastic Championships. 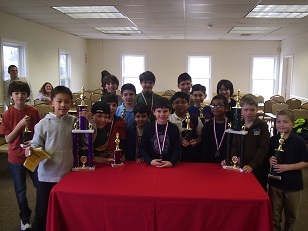 After defeating the top seed, Vincent Xu went on to win the very competitive K-8 section with 3.5/4. Dream Team members Sam Forfang and Brent McCreesh drew in round three and tied for first place in K-5 section. Finally, Dream Team member Sean Thomas cruised to victory in the K-2 section. Sean scored a perfect 4/4! Be sure to make it to our next K-8 Championships on February 10th.